← Our other new alpaca! This year’s roving is in! Mom, Dad and Grammy drove the new roving up to Fort Collins for me on Friday! I was so excited, I sat down and spun in the middle of a work day, in a completely not posed, spontaneous act of fiber adoration. In this completely-not-staged shot, I’m just attaching Marcello’s roving to my leader (the white yarn, it allows me to attach the un-spun roving to the wheel). Well, maybe it was a little posed. Anyway, I have bags and bags of lovely fiber to work with now, and I’ve already spun some 450 yards worth. So far, I’ve only worked with Marcello and Tuscany, but both are very nice this year. I might even venture to say that the softness of Marcello’s roving has improved. 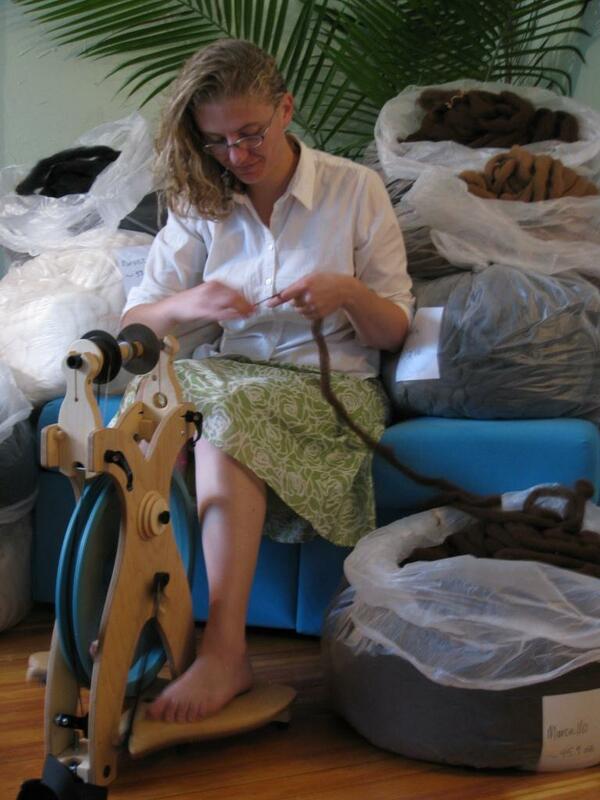 I always spin sitting in the center of my couch, surrounded by all the bags of roving I have (each open just a little, so the fiber peeks out), in a nice skirt. Snort. Unfortunately, it’s been too hot to think about moving so far this week, so I’ve been mostly laying in front of a fan reading in the evenings. Today should be cooler, though. This entry was posted in fiber art and tagged alpaca fiber, alpaca yarn, fiber, handspinning, roving, spinning. Bookmark the permalink. 4 Responses to This year’s roving is in! You have bags and bags of it! My goodness. That should keep you going for a little while. I must look back over your older posts because I may have the story wrong. 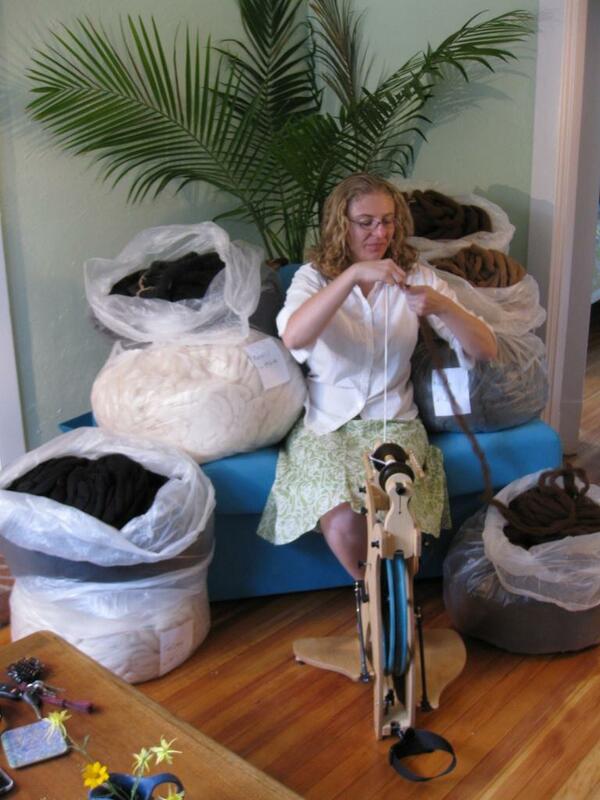 You own the alpacas, but someone else turns the fleece into roving? Is that it? Then when you get it back, you spin it and who does the knitting? Do you do that too? You are a busy lady. The colours of the roving are gorgeous. We own the alpacas, and at first we did ALL the steps (except shearing, we still brought an expert in for that). We washed the fleece, carded it using hand carders or (eventually) a drum carder, then I spun the yarn and Mom knits it. This year we sent all of our fleece to the mill to be washed and carded, leaving the more fun parts like spinning and knitting, for ourselves. It was just taking TOO long to get through all the steps. Hey! Can I buy some yarn for my mama? She just retired and she knits. You sure can! And to make it even more fun, you have pretty much every color under the sun to choose from. Let me know, we can chat about what you want me to spin for her.